Part of L’Orchidée Complex, Villa Penda 7 is a three-bedroom private sanctuary for guests that offers a chance to rest and rejuvenate amidst a naturally abundant surrounding. The complex offers a shuttle service from one villa to another as well as other services in the complex. 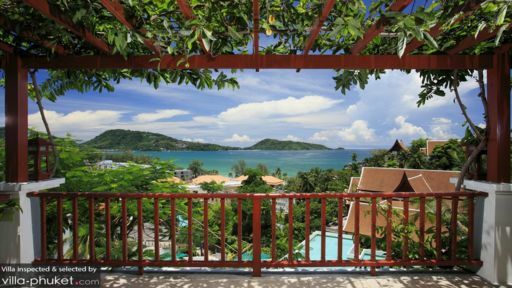 Being close to Patong and the beach, which is the most happening of all the beaches in Phuket, is the perfect way to spend your tropical vacation. You can explore the nightlife, relax on the beach, and dance your worries away. Of the three bedrooms at Villa Penda 7, the first is the master bedroom which adjoins to a private terrace with lounge chairs and an enviable view. The second and third bedrooms make a family compound as they share a bathroom. The master bedroom is furnished with a king-sized bed, the second with double beds, and the last bedroom with bunk beds. There is an office space in the master suite along with an en-suite bathroom with whirlpool tub. 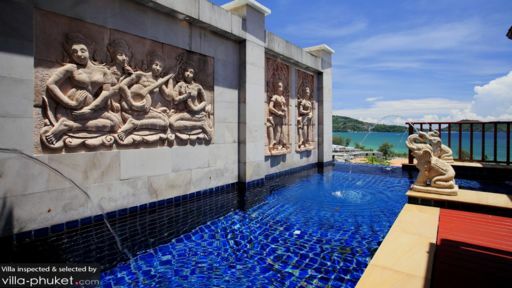 With a stunning view of Patong Bay right from the villa, you will feel exhilarated while you lounge in the 20-metre swimming pool with a slight infinity-edge. The pool is fed by stone sculptures for a well-landscaped vibe and is surrounded by lush tropical foliage that bends and sways in the tropical breeze. Beautifully articulate stone walls line the side of the pool, and you can rest up on the outdoor sitting area which is a nice and comfortable space from which to take in the spectacular panoramic vista of the beach. A furnished terrace with lounge chairs and alfresco dining along with a bar is also accessible to guests. Aside from the outdoor living area which is a great way to relax amidst the ocean breeze, there is an indoor living space as well available to guests. With cozy wooden interiors, faux leather couches, and a traditional Thai ceiling it makes for a common ground where everyone can gather and mingle. There is another sitting space with wooden couches and behind it you will find a window seat which makes for a great reading nook for the bookworms. There are large fans that keep the area breezy and you can always let in the fresh air through the glass doors. Villa Penda 7 also offers both outdoor and indoor dining, and the indoor dining comprises a six-seater dining table for enjoying deliciously prepared meals. There is an office space as well in the corner to catch up on some work. A fully-equipped kitchen complete with cooker hood and coffee machine is also accessible to guests. Since the complex provides a shuttle service you can head to the common pool, kids’ play area and the gym as well. There are ample services at the villa and the complex to keep you occupied including tennis courts, massages, car rentals to take you around the island at an additional cost. The staff is all too happy to prepare your meals if you wish for additional charge. They can arrange for transport and even give recommendations on where to go and what to see around Patong! 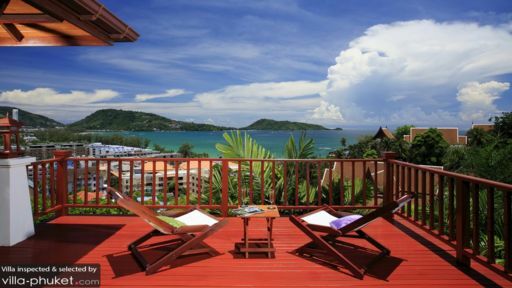 Patong beach and the main attractions in the area are all close to the villa so you can head out without a worry. For an excellent nightlife, Patong beach is the place to be with beer bars, GoGo bars, discos, and restaurants. For the surf lovers, Kalim beach is the ideal spot with its surfing competitions. The beach bars you can try out include Joe’s Downstairs, White Box bar and for food do check out Pan Yah for Thai food. Our staying in the Villa was great: many freinds come to visit us because of the very nice Villa and the nice swimmiing pool with view over the gulf of Patong. The service was very reactive and kind, also if sometimes they needed to come back 2-3 times to really fix the issue.